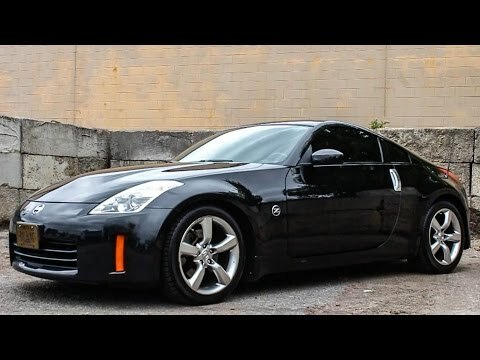 If you're looking for a rear-wheel-drive sports car that offers scintillating performance, head-turning style, impressive amenities and an excellent price-to-value index, the 350Z Coupe should be high on your must-drive list. This is the greatest looking, most comfortable 2 seater sports car there is! This car is beautiful, has many great features, and can go fast when needed;). It is gorgeous on the inside and out. I have a 2008 hr. It came with heated leather seats, which I love in the winter time! The car is 10 years old now and still runs just as great as ever (with maintenance, of course!). It does not have the most wonderful gas mileage, but it is not too bad. There are about 6 cup holders placed throughout this 2-seater car (quite a few too many lol), 3 different charging ports, and a 6 CD changer with a Bose speaker. The only downside is that if you live somewhere where winters are bad with snow and ice, you will not be wanting to drive this around (actually you won't be able to!). Overall this is the best car I have ever owned! Very fun car that is comfortable enough to daily drive. It is very sporty, so it has more of a stiff ride. But most people do not get this car for comfort. It is very quick and has very snappy handling. Compared to other vehicles within the same price range, it has a lot to offer. Over 300 horsepower, a little over 5 second 0-60 mph, and is very glued to the ground. Although the main focus of the car is not comfort, it is actually very easy to drive for long periods of time. The seats bolster you fairly snuggly, but not to the point of discomfort. The seats are very comfortable and the suspension has enough give to bumps on the road, that a cruise on uneven roads can still be enjoyable. Sporty, high performance and comfortable fun ride! I absolutely LOVE my car. I purchased it one year used with 16K miles and have owned it for 10 years now. It is a convertible which is so much fun to drive! It is a sporty, fast and exciting car to drive. The seats are the most comfortable to sit in out of any car I have owned! I have not had any major engine problems over the years I have owned it. The only true expense is having to replace the tires are they are performance tires and cannot be rotated. The tire sizes are different from front to back. It is a 2-seater with plenty of leg room. The trunk is not huge but big enough to fit an ice hockey bag.